Jalal Hassan was long touted as Iraq’s undisputed number one until a knee injury last season delayed his accession to the national team. He returned to his best this season helping to guide his club Arbil to the final of the AFC Cup, saving three penalties in a penalty shoot-out victory over Lebanese club Al-Nejmeh in the knock-out stages on the way to the final. The keeper was born in Diwaniya in the Qadisiya province in the south of Iraq where he began playing for a local team known as Al-Thawra Al-Beetha (“The White Revolution”) and because of this he was nicknamed ‘the White Cat’ after he burst onto the international scene with the youth and Olympic side a few years back, with people citing Jalal as the natural successor to the legendary goalkeeper of the 50s and 60s, Mohammed Thamir, the custodian they called the Black Cat. After playing lower division football in his home city, he was spotted by former Najaf captain Falah Hassan, a native of Diwaniya and was recommended to Iraqi first division side Karbala. He was given his chance in the first team after an injury to the regular keeper and after several outstanding performances in the green of Karbala, he was called into the Iraqi U-19s side. Things have gone from strength to strength for Jalal since then transferring to one of the best teams in the Iraqi league and is now first choice between the posts after the retirement of 2007 Asian Cup keeper Nour Sabri. Ali Yasin is the only member of the 23-man squad who will travel to the 2015 Asian Cup that is still uncapped at international level. The third choice keeper has international pedigree in his footballing family with his late father Yasin Yas having represented the Iraqi national side in the mid-Seventies. He has been a regular in the match day squads from the start of 2014 after he was called into the national side by Hakim Shaker, his coach with the Iraqi youth team, who brought him into the international fold. The goalkeeper recently moved to Baghdad side Al-Naft after his previous employers Naft Al-Janoub were unable to pay him the full amount of his contract after spending a season and a half at the southern based club. He has played previously for Karbala and Al-Najaf in the Iraqi league. The young keeper has played for the Iraqi youth side and the Olympic side, but has been mainly used as an understudy to Mohammed Hamed. Mohammed Hamed was Iraq’s first choice keeper under the previous coach Hakim Shaker when he was selected ahead of Nour Sabri and injured Jalal Hassan, however his sluggish reflexes which allowed in Saudi Arabia’s winning goal in the Asian Cup qualifying defeat in Dammam, saw him dropped and has been playing second fiddle to Jalal Hassan since. Mohammed made his name with the Iraqi youth side at the 2012 AFC Youth Championship, having previously played for the side in 2009 and his reputation was further enhanced with his heroics at the FIFA Youth U-20 Cup in Turkey, where Iraq finished in fourth place. The man between the posts started his playing career at Al-Ramadi in the Anbar province before moving to Al-Kahraba in Baghdad in 2009 and then onto Al-Shurta, where he’s currently second choice behind veteran Mohammed Kasid. He made his international debut in a training game against Malaysia in Ajman in 2013 and has since made 10 appearances for the national side. The Iraqi lion was brought into the national team almost unnoticed when his name was added to a training camp in the run-up to the 2010 Gulf Cup in Yemen. Iraqi commentators had no idea who the rugged ball playing central defender was, when he lined-up for a friendly against India. By the end of the match, everyone knew his name. Ahmed came from modest beginnings, starting out with his home side, provincial side Al-Qayyarah Sports Club in the Nineveh province, but he knew he had to leave the club to make his name in the game, moving first to Al-Sharqat and then Salah-Al-Deen. It was only in 2009 when he was signed by one of Iraq’s top clubs Arbil on a one-year contract worth 60m Iraqi dinars, that he earned a place in the Iraqi youth side and eventually found himself in the national team. He’s already had a loan spell at Al-Wasl in the UAE league and is currently contracted to Emirate club Ajman. The defender had been likened to the great Adnan Dirjal for his die-hard defending style and in his 42 appearances for Iraq, Ahmed has exhibited leadership qualities of a future Iraqi captain. In a commanding first appearance for the national side, Ali Bahjat was left with a bandaged head and slight concussion in a World Cup qualifier against Japan in Saitama and there were reports of a scout from La Liga side Valencia being interested in the defender, however Ali is still waiting for his call. The Baghdad born player has represented a host of clubs over the past nine years, including spending a season in the Syrian league in the 2006-2007 season, however it was his three seasons at Al-Karkh that he earned his selection into the Iraq U-19s side and the Olympic side. The left footed centre half has been unable to dislodge the defensive partnership of Salam Shaker and Ahmed Ibrahim and was fourth choice when Ali Rahema was fit. In spite of making 21 appearances, Ali has always been seen as a reserve and even though his passport mentions his date of birth as 1992 and suggests a bright future in the national side, the Al-Shurta player is actually 27 years of age. His versatility allows him to be used as a left back if needed and can also play in a back three, but he looks unlikely to have much playing time at the Asian Cup in Australia, if the main defenders are fit. One of the few members of Iraq’s Under 20 side at the 2013 FIFA World Youth Cup who actually played in Turkey without forging his passport documents. 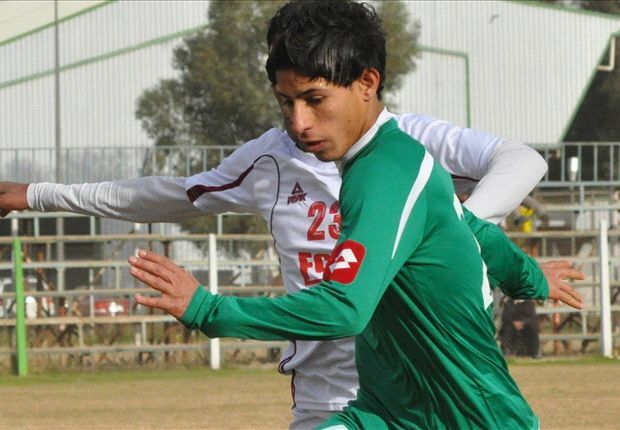 The former graduate of the Ammo Baba Football School was born in 1994 and first made his league debut for Al-Talaba and then Al-Karkh where he became a regular in one of the Iraqi league’s youngest team before he moved north to four-time Iraqi league winners Arbil half-way through the 2012-2013 season for a one and a half year deal worth 40m Iraqi dinars. Ali is one of few Iraqi footballers to have played at every level for Iraq from Ishbal (Cubs) to the senior side after making his international debut last year in the 6-0 defeat to Chile in Copenhagen. The player supported Al-Zawraa while he was growing up and cites Spanish midfielder Xabi Alonso as his favourite player and is predictably a Real Madrid fan. The defender, a dead-ball specialist, taking both free-kicks and penalties, can be deployed in the centre of defence, at right back and as a defensive midfielder. Ali has had recent contract offers from clubs in Turkey and Portugal and looks likely to leave Arbil because of the club’s current financial difficulties, when his contract runs out at the end of this season. One of the veterans in the Iraqi squad, Salam returned to the Iraqi league this season after spending six seasons in the Qatar Star League with Al-Khor. The 6ft 3 inch central defender was first called into the national side under Norwegian Egil Olsen in 2008 after his positive displays at the 2007 King’s Cup in Thailand for Arbil masquerading as the Iraqi B side and came into the team to replace injured Ali Rahema. Salam is the son of Shaker Ali, a former Talaba and international defender who made eight appearances in the late 70s for the national side, a mark which Salam Shaker has easily surpassed, appearing almost 10 times more for the national side – currently with 76 appearances and four goals in almost seven years with the Lions of Mesopotamia. However recently the 33 year-old defender has spoken of his intentions to retire from international football in the near future after seeing a decline in his usual level in the past couple of years and this Asian Cup could be his last major tournament with the national side. An attacking right back who has won his place in the national team after his senseless sending off in the final of the 2013 Asian U-22 Cup saw him lose his position for most of 2014 to his 36-year-old club-mate Mahdi Karim. He was thrown in at the deep end by former Iraqi coach Zico when he was handed his international debut in a World Cup qualifier in Saitama against Japan. Walid first started his career in the lower divisions in the Amana youth team and then Al-Siyaha, and then onto Kahraba in 2009. But it was his loan move to Arbil to play in the AFC Cup which got him noticed and was drafted into the national side. Comfortable when marauding forward but can be a liability defensively. The third son of the late Al-Tayaran defender Saeed Mejbil to play for Iraq, following his elder brothers Samar and Samal. The 24-year-old was part of the Al-Karkh youth set-up before he joined-up with his brother Samar in Libya, where he spent a season in the Al-Ahly Tripoli reserves. After returning to Baghdad in 2008, he became a regular for Nadi Amana Baghdad and earned selection to the Olympic side and then the national side. Samih made his debut this year against Peru and made his second international appearance in the recent 0-0 draw with Uzbekistan in Sharjah. While he’s likely to be a back-up for Walid Salim, it’s ironic that Radhi Shanaishel had pencilled in his brother Samal Saeed, also a right back, to be part of the Asian Cup squad until the FA’s request to include Samal and two other players which the new coach had insisted on selecting, was declined by the AFC after the deadline had passed. His brother’s absence means Samih gets his opportunity to be part of the Asian Cup squad in Australia. A surprise pick ahead of Mahdi Karim who was Iraq’s first choice throughout their matches in 2014. A lot has been said about the attacking full back since he made his international bow at the 2013 FIFA World Youth Cup. However despite publicly professing receiving lucrative offers from top European clubs Napoli, Tottenham Hotspur and lately CF Granada, his form has dipped recently and was heavily blamed for the 2-1 defeat to Saudi Arabia in the Asian Cup qualifiers, where he was at fault for the opening goal. Critics and fans have also noticed that he has gained a few pounds around the waist since his move to the Turkish league last season. If he wants to be known as one of Asian’s best, Ali has to show the kind of performances that made people stand up and take note of his name in Turkey almost two years ago. His indiscipline is one thing that has gone unnoticed and could be a worry for his coach, with the defender picking up a staggering 11 cautions in only 27 appearances for the national side. Fans will expect more from Asia’s former young player of the year in Australia. Iraqi left backs have been like London buses of late, you wait ages for one and two come along at the same time. That has been the scenario for the talented Maysan-born Dhargham, who progressed through the Iraqi U-17s, U-19s, Olympic side and the national side in only one season, scoring a delightful free-kick on his debut at the 2013 Gulf Cup against Yemen. The boy’s international development has been obstructed by what Liverpool’s legendary manager Bill Shankly would have called ‘a colossus’, Ali Adnan. Though visibly physically inferior to his contemporary, the player who started at Naft Maysan is just as talented as his Turkish based team-mate and is a luxury reserve to have in the squad. Osama Rashid is one of Iraq’s European contingent, a last minute call-up to the squad by Radhi Shanaishel. The one-time Feyenoord youth graduate, currently studying sports marketing, played 16 times for the Netherlands at Under 17 level before he switched to represent the country of his birth. Osama made his international debut almost four years ago under Iraq’s former German coach Wolfgang Sidka after he was impressed by his passing ability. However after only one game against Kuwait, red-tape got in the way and he had to wait almost a year for international clearance from FIFA after some discrepancy over the details on his Iraqi documents. The Brazilian legend Zico saw something special in the ball-playing midfielder and gave him a start in a must win World Cup qualifier against Jordan, which Iraq won. However after the game, Zico left and Osama was out of the team. Despite getting a match-winning goal in the Olympic team’s training camp in Georgia, Hakim Shaker with his well-known prejudice against the mughtarabeen (expatriates) didn’t select the midfielder for the Asian Games nor the Gulf Cup. Osama and Yaser Kasim could form a solid midfield duo in Radhi Shanaishel’s 4-2-3-1 formation. His presence maybe the reason why Radhi Shanaishel saw fit to drop Hakim Shaker’s 25-year-old ‘adopted son’ Saif Salman for the Asian Cup. No player in the history of the national side has made his position his own after only 90 minutes, but that was what Yaser Kasim, the Baghdad-born West Londoner, did when he bossed the midfield in Iraq’s final Asian Cup qualifier against China. The midfielder had refused an earlier call-up prior to the qualifying game with Saudi Arabia, deciding to concentrate on playing for Swindon Town in League One, where he had become a key figure in the club’s five-man midfield, which also includes Australia’s Massimo Luongo. He may also have refused the call-up after he was made to pay his own way to Baghdad from London in the two previous trips with the Olympic side. Yaser, along with Ahmed Yasin and Osama Rashid were first selected in the national side in 2011 under Wolfgang Sidka but have only now managed to cement their places in the Iraqi squad. Radhi Shanaishel will know a lot about the physical but stylish ball-playing midfielder, nicknamed ‘the Iraqi Pirlo’, after training him while he was in charge of the Olympic side. The midfielder has finally found regular first team football at the County Ground after an unproductive spell at Brighton and loans stints at Macclesfield Town and Luton and the Asian Cup may be the launching pad for this level-headed passer, whose own chairman believes wouldn’t look out of place turning out for Real or Barça at the Camp Nou or Bernabéu. A member of the 2011 Asian Cup squad, Saad Abdul-Amir has been the driving engine of the Arbil midfield for the past four years since his transfer north to the Yellow Citadel, where he won a league title in 2012. Saad began playing for shaabiya teams in the Shuala district of Baghdad, then with the Al-Shuala club juniors and Al-Kadhimiya before joining Al-Karkh, guiding them to promotion back to the top flight in 2010. The 26-year old plays in the centre of the park but is known to make runs down the flanks and into the box. Saad is now the most experienced central midfielder in the team, with 37 caps since making his debut in 2010. Then he had been included in German Wolfgang Sidka’s first squad and was one of only three players from an initial 26 players that was selected for the final 2010 WAFF Championship squad, and made his debut in a 3-2 friendly win over Oman prior to the tournament. With the likes of Qusai Munir, Salih Sadir and Nashat Akram blocking his way, Saad had to play understudy to the 2007 Asian Cup winners for most of his time with the national side. But today he looks to be Iraq’s main director in the centre midfield and he already knows what new coach Radhi Shanaishel demands from his players, having played under him at Olympic level. At 20, Ali Husni has already captained his home town club, the grand Nadi Al-Minaa Al-Basri and for the past couple of the seasons he has been considered to be the best player in the Iraqi league. A cross between Habib Jafar and Laith Hussein, the vastly talented midfielder has returned from exile after the spell under Hakim Shaker ended after the Gulf Cup. Two summers ago, the player made some disparaging remarks about how Hakim had selected some of the youth team players for the World Youth Cup, inadvertently implying that the coach had asked for money from some players to get a place on the team. Ali was not the only player who made such comments, the other player Amjad Walid was also sent to Iraqi football equivalent of the Siberian gulag and has not been seen since. But the strong support from Iraqi football fans forced the hand of the FA and the Army Major and national coach Hakim Shaker, to recall Ali Husni and he played him for the final seven minutes in a friendly against North Korea and then subsequently dropped him for the following Asian Cup qualifier. This would be a familiar pattern for Basra Port Club’s No.8 as he was dropped on the eve of both the Asian Games and the Gulf Cup. Radhi Shanaishel has ended his prison sentence under the old warden Hakim Shaker and it seems that from his last two outings against Kuwait and Uzbekistan while Ali has bags of potential he lacks experience at international and will take a bit of time to adjust with only 97 minutes of international football and a few miles on his odometer. But with Radhi Shanaishel at the helm of the national side, the shackles have disappeared and the Karbala-born midfielder is free to make his mark at the Asian Cup. The 21-year-old’s international career looked to be over last October when his misplaced pass led to Saudi Arabia’s second goal in the 2-0 Asian Cup qualifying defeat in Amman. But the midfielder standing at just 5 feet 4 inches, nicknamed Zola after the diminutive Italian playmaker, proved to be resilient and has gradually recovered from his costly mishap. Mahdi is one of Hakim Shaker’s young charges, playing a part in both the 2012 AFC Youth Championship and 2013 FIFA Youth Cup sides. He was given his debut in Serbian Vladimir Petrović’s final game against Chile in Copenhagen but it was only when Hakim Shaker took charge in his second spell that Mahdi became a permanent fixture in the squad. His versatility has seen him play in centre of midfield and as an advanced forward and in two friendly games in Manama against Yemen and Bahrain, Mahdi was deployed as a right winger and has even played at left wing. Last season, the player almost left Al-Shurta where he has been playing since 2009, after an altercation with Brazilian coach Lorival Santos and had been a subject of a season-long loan offer from Al-Talaba which was flatly refused by the Police Club. Mahdi has already said he has achieved his own lifelong dream and that of his family to represent the national team, which his cousin Mohanad Nassir had also done, with his next target being to win a tournament with Iraq and play in Europe. The Örebro Talent will be one of the first players to benefit from the absence of Hakim Shaker on the side-lines. In an interview after the second friendly game with Uzbekistan with Waar TV, the Swedish player was asked what was tactically different between the new coach and predecessor and he laughed, gave a wry smile and said “Well, what can I say?” The winger and the previous coach never saw eye to eye and completed only three games in 15 matches under his tenure-ship and after he kicked out on the bench after being subbed in the Gulf Cup semi-final against Bahrain in Manama, Ahmed was dropped. Only mediation between former players and the coach saw him return but there was never the kind of reciprocal harmony between the pair and it seemed that the player was selected to keep the coach’s critics at bay, after he dropped the rest of the expatriate professionals. This could be the moment that Ahmed makes his mark in international football. After a productive season in the Allsvenskan, with 5 assists and two goals in 29 games, leading his club to sixth in the Swedish top division, Ahmed could be a revelation in Australia if he manages to stamp his authority on matches. The wide-man can best be described as a gazelle on the wings, unstoppable when he’s in full-flow. The captain of Al-Shurta was first given his debut in 2009 at just 17 years of age by Radhi Shanaishel with cameo appearances in two matches that the former Iraqi captain was in charge of, in his brief stint as caretaker. The forward is the youngest of three footballing brothers, Mohammed and Alaa, the sons of former army track and field athlete Kelaf Mansour. Born and brought up in the city of Kut, Amjad broke into Kut’s first team at the age of just 14 and months later found himself in the starting line-up of the Iraq Under-17s under Kadhim Khalaf and has played for the U-19 and the Olympic team, winning the AFC U-22 Cup where he was named the player of the tournament. 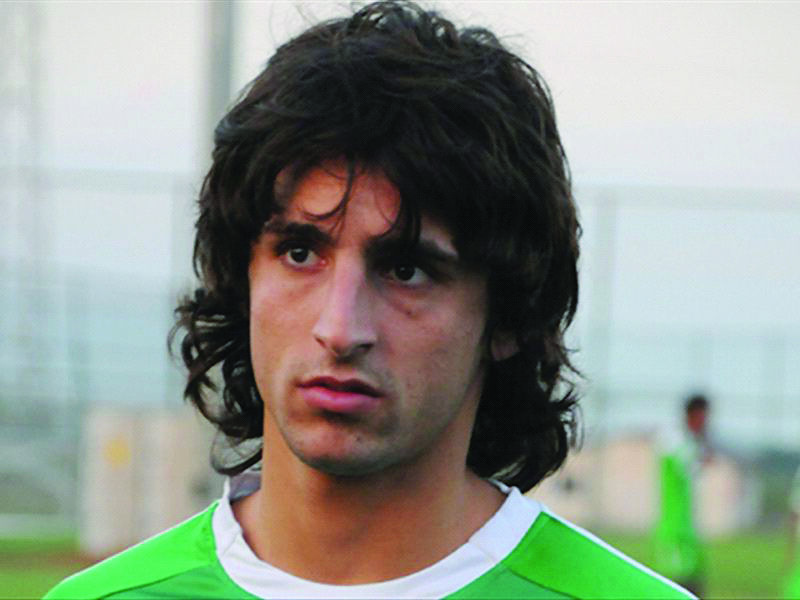 There was a time where Amjad looked to have made the right flank his own domain after his match-winning performances in the Iraqi league but his progression to the national team was stunted by the refusal of previous coaches to take a chance on the winger, but ironically it was only when his form dipped that he was finally given a chance. The player has great potential but has yet to display the pulsating runs down the wings which he made his name in the Iraqi league in his 19 appearances for the national side. The Iraqi fans are waiting for this exciting talent to find his way with Asood Al-Rafidain and if or when he does, Amjad equipped with his defence splitting pace will be one of Iraq’s potent threats in attack. It’s not every day you can say a member of the Iraqi national side is a heir to a confectionery empire but Humam Tariq is just that, the player’s grandfather founded the famous Baghdad based Faraj Nuash & Sons company in 1954. But Humam, while helping out in the family business in his spare time making the sweets, Humam decided he wanted to pursue a career in football, and from an early age he use to play with older kids at the local shaabiya football pitches near where he grew up before he joined the youth teams at Al-Zawraa and then Al-Quwa Al-Jawiya. In 2010 at the age of 17 he was drafted into the first team for a league match against Salah-Al-Deen and the following season, Humam became a permanent fixture in the Blue Falcon’s first team. It was his performances with the Iraqi youth side under Hakim Shaker that got him noticed and after Hakim took charge of the national side, the left sided midfielder was handed his debut at 19 years in a friendly match against Tunisia and was a regular in the Iraqi side during the 2013 Gulf Cup in Manama, where he lauded for his lung-busting displays in the final. This season, he moved to the UAE signing a deal with Dubai based Al-Ahly however he was parked at lowly Al-Dhafra after Al-Ahly’s first team coach Cosmin Olăroiu felt he didn’t need him as part of the first team for the 2014-15 season and sent him out on loan to gain more experience. While the 21-year-old is constantly seen on the move whilst he’s on the pitch, either pressing the opposition or making forward runs, his detractors have thrown the criticism at him that as an attacking left sided forward, he creates little in regards to goal opportunities in the final third, nor contributes with any goals. The Asian Cup will be a learning curve for Humam. With only his second touch of the ball on his debut against Kuwait at the Gulf Cup in Riyadh, Justin Meram almost announced himself to the Iraqi jumhour with a goal when he dribbled past three defenders and let rip with a venomous effort, which was blocked by a defender. But the move wasn’t broken down and he found himself in the penalty box and had an appeal for a penalty kick turned down. In the last minute of first half injury, his goal-bound shot was handled on the line by a defender, once again the Slovenian referee waved away the calls. The MLS forward has shown in only five appearances for Asood Al-Rafidain that he’s the kind of player that can create goal opportunities in the final third and has ability to dribble and go past defenders, ball skills he learnt growing up in Shelby Township. Alaa Abdul-Zahra may rue the day Iraq’s former coach German Wolfgang Sidka asked him to play on the left wing, because since then, the forward once deemed the natural heir to goalscoring legend Ahmed Radhi and that’s not the words of the Iraqi media or supporters but the former Al-Zawraa striker himself, has been used as either a wide attacker or in the hole behind the central striker. Alaa had been the top goalscorer with the Iraqi U-19s and the Olympic teams but once he made it into the national set-up, the German Sidka and his 4-2-3-1 formation merited the need for one striker, Younis Mahmoud, and Alaa was moved out to the left wing and the rest as they say is history. The forward has managed just 13 goals in 77 appearances for the senior side, a meagre return, considering his goalscoring record in the Olympic qualifying campaign where he netted 8 times in 12 outings and his four goals in four games at the 2006 AFC Youth Championship in India. However Alaa has managed to carve himself out a successful playing career, with spells in Iran, Jordan, Sudan and Qatar and at the age of 30, the forward is one of the veterans in Radhi Shanaishel’s side, having played at the previous Asian Cup tournament in Doha four years ago and will be a key performer for Iraq in Australia. 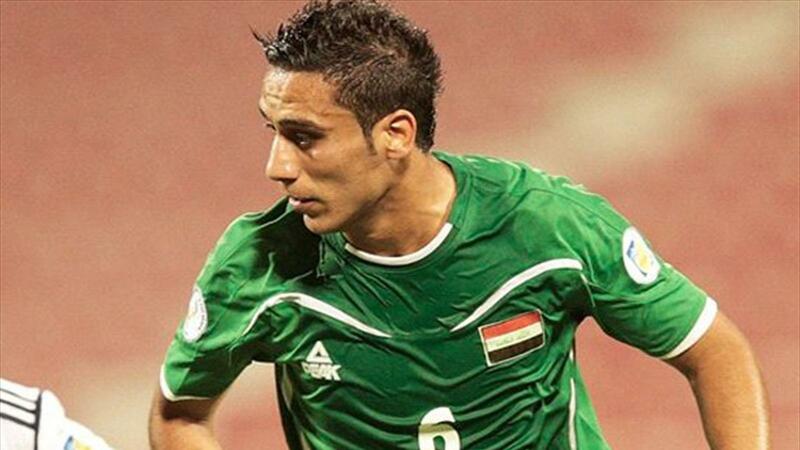 Marwan Hussein is Iraq’s great hope to replace Younis Mahmoud as the national team’s main striker after his four goals at the AFC Asian U-22 Cup last year however after six appearances for the Lions of Mesopotamia, the Al-Shurta striker has yet to break his duck. The ‘Torres’ curse on Iraqi strikers in the national team continues and after fan’s expectations for youth team striker Mohanad Abdul-Rahim and Iraqi league top scorer Amjad Radhi, who together have managed a paltry five goals between them in 50 games for Iraq, fans will be hoping Marwan will do much better. Radhi Shanaishel will know a lot about the striker, after working with him in his previous spell at Al-Zawraa, where Marwan started out. The Baghdad-born forward moved to rivals Al-Shurta this season after spending five seasons with the White Seagulls, where he won a league title in 2011 under the stewardship of Radhi Shanaishel. The striker is a goalscorer but with a host of Iraqi striker have tried and failed to make their mark, Marwan has still yet to show the kind of confidence in front of goal in the Iraqi jersey, as he had done with the Olympic side. If he can find his goalscoring touch at the Asian Cup, then Iraq could go further than expected in Australia. The Iraqi captain was dragged back into the international fold by previous coach Hakim Shaker after a public appeal on national television in which Hakim articulated to the striker that he “had to” return to the national side after initially (not for the first time) announcing his retirement from the game after the World Cup qualifying defeat to Japan in Doha. 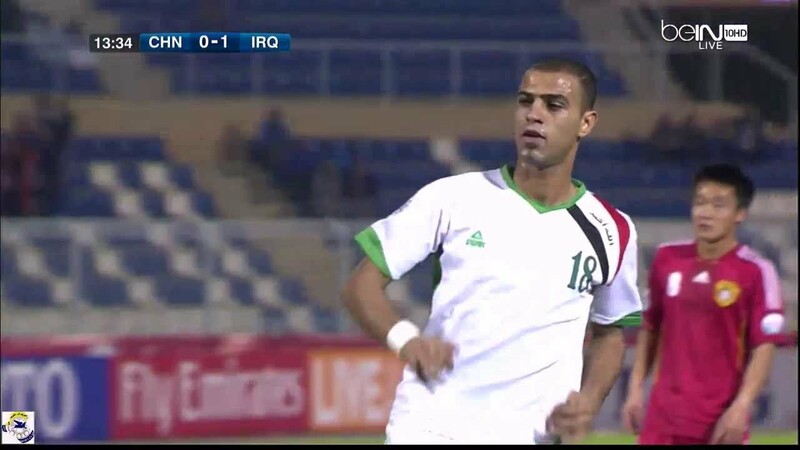 He returned and scored on his comeback against Yemen and is still considered Iraq’s main goal threat. His endless critics have blamed his constant presence as a starter in the national side as one of the reasons for the failure to find a successor to take on the mantle of the No.10, with little confidence shown to Amjad Radhi, Mohanad Abdul-Rahim and Marwan Hussein by any of Iraq’s national coaches. The striker has not played any competitive club football after leaving Saudi club Al-Ahly almost 14 months ago and since then the unattached footballer has played a mere 17 matches (scoring 8 goals) for the Iraqi national and Olympic teams. While the forward from Dibbis in the Kirkuk province has said that he intends to carry on playing on after the Asian Cup, his fourth Asian tournament and looks to the 2018 World Cup qualifiers, at 34 years, this maybe the final time we see the man who scored the winner in the final 2007 Asian Cup lead the Lions of Mesopotamia and wear the Iraqi jersey.